NSA’s new Income and Fees Study has been released. The 2018-2019 study covers national, state,and regional information on practices, fees, and more. Demographic data on the respondents describes type of practice, community size, gender, credentials, years in practice, and education level. Operating expenses broken down by category are included in addition to information on succession planning, billing practices, practice management and more. 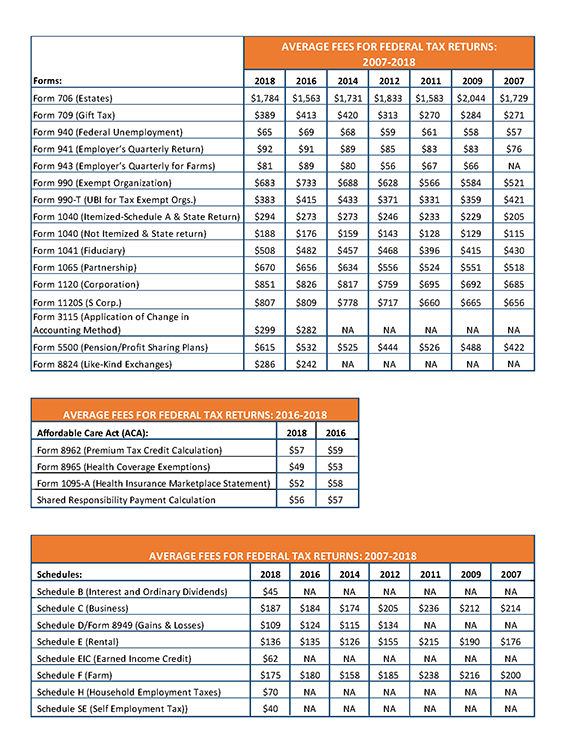 The 2018-2019 survey includes new schedules for federal tax returns, specifically, Schedule B (Interest and Ordinary Dividends), Schedule EIC (Earned Income Credit), Schedule H (Household Employment Taxes), and Schedule SE (Self Employment Tax). Additionally, new questions about fees for W-2 and 1099 preparation were added as well as additional detail regarding fees for bookkeeping services. The fee data collected for payroll services were reported in two separate categories of full payroll services and after-fact. Recognizing the growing impact of hacking and phishing on the industry, a question about cyber liability insurance was also included this year. Here are some highlights of the study which is available to members free as part of their benefits package. 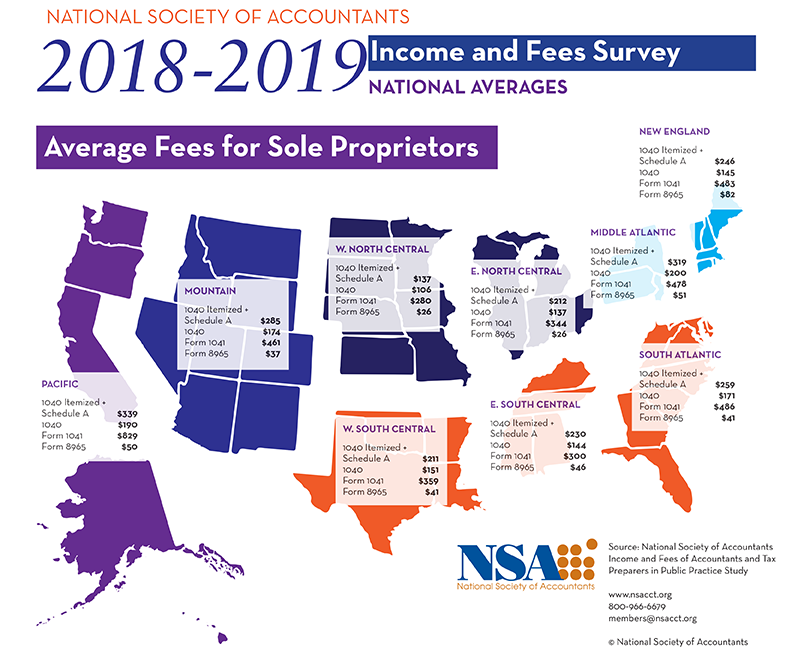 Tax and accounting firms surveyed are owners, principals and partners of “Main Street” tax and accounting practices who have an average of 28 years in public practice and hold multiple credentials. The average annual gross income reported increased to $302,267 from $269,461 two years ago. New data suggests that 54% of gross income is derived from tax preparation, planning and related tax services, which is a decrease from 64% two years ago. Salary and benefit expenses (other than retirement) have virtually remained that same, at just over 38% over the previous two years. Staff numbers have changed, but only a .3 decrease from 3.5 to 3.2. Seasonal hiring has decreased to an average of 2.3 the 2015-2016 survey report of 3.5, coming very close to the statistics from the 2013-2014 data. New in this year’s survey is data on how many preparers have obtained cyber liability insurance. Our data tells us that only 48% of those who responded have policies. However, the number of tax professionals who use secure file transfer portals has grown 10%, to 64%, and 69% use online/remote data backup. Have you wondered what your competitors and peers charge for similar work? Do you charge enough? The tax fee calculator can help. Average fees for federal returns have continued to fluctuate. Some forms, like Form 706 has risen from $1,563 to $1,784, while others have experienced marked decreases in cost. Over all, ACA forms have dropped in price as well, but only by a few dollars since 2016. 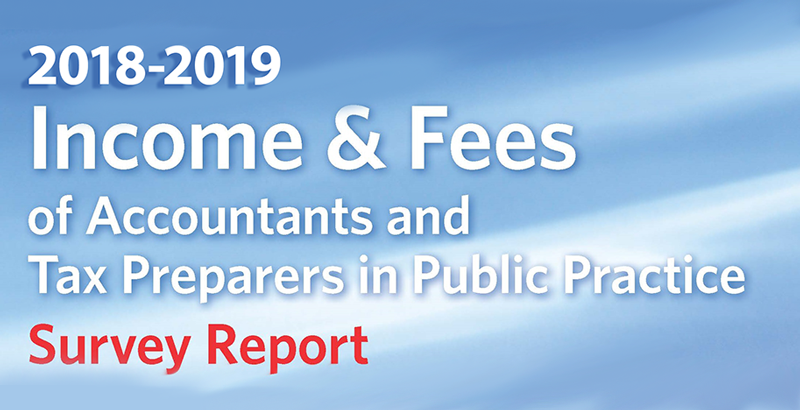 New data tells us that accountants and tax preparers (sole proprietors) are charging an average of $158 per hour for Federal and State returns, $200 per hour for Offers in Compromise, and $151 for Elder Care related services. All three of these examples reflect increases. The previous survey produced the following hourly fees, $150, $177, and $131, respectively. It is also to be noted that 71% of practices charge clients a fee if they bring in disorganized or incomplete files. In contrast, 2% fewer practices charge retainer fees for IRS audits. The majority in the current survey suggest that the number of audits has stayed the same since the 2016-17 study. Seven percent of participants feel as though their audits have increased. Preparers charging for audit response letters – when they did not prepare the return – has become more common. In the past survey, 47.5% reported that they charge in cases like these. Now, the number of practitioners who bill for these letters is closer to 58%, with an average fee of $136.98. 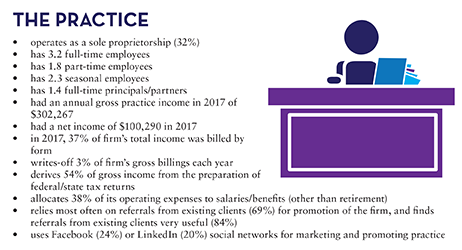 In other audit situations, when the practitioner is not at fault, 83% of offices charge an hourly fee of $159.91 to represent their client, and an average retainer fee of $774. The complete survey contains even more statistical information about the state of the profession. Members can review more highlights of the study here, and members can access the entire library here.